Late Cretaceous of North America. About 66 million years ago. From the Latin words draco (meaning dragon) + rex (meaning king), and “hogwarts,” the fictional school from the Harry Potter* book series. TCMI 2004.17.1, nearly complete skull, one lower tooth, plus first, third, eighth and ninth cervical vertebra. Dracorex hogwartsia was a real dinosaur, named by paleontologists Bob Bakker and Victor Porter after the fictional "Hogwarts Academy" from the popular Harry Potter* books. 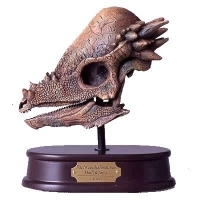 The skull of Dracorex hogwartsia is one of the most unusual of all the dinosaurs. The suface of the skull is completely covered in bumps and horns. Perhaps these served as a form of protection (imagine trying to take a bite), or they may simply have been for display. Whatever their use, these horns and bumps give Dracorex a very dragon-like appearance. One of the Dracorex skulls discovered contains the animal's front teeth, and they reveal an exciting possibility. The incisors are serrated—perhaps the first evidence of an omnivorous dinosaur! Scientists speculate whether the skull may simply be from a young Pachycephalosaurus. It's possible juveniles were born with flat skulls and the prominent Pachycephalo- saurus dome appeared as the animal grew into adulthood. For now, this theory remains unproven. In any case, the "Dracorex" skull is a real skull from one of the most interesting dinosaurs to ever roam planet earth! from the Prehistoric Planet Store! *“Dracorex hogwartsia” is a species name in the scientific domain. Prehistoric Planet is not affiliated with the Harry Potter brand. This item is not endorsed by JK Rowling or other Harry Potter copyright holders.